A dashboard is a read-only view of Ad Hoc reports where users can see multiple charts and tables on one page. Anything added to a dashboard is called a Dashlet. Restaurant365 comes with a number of dashboards. With the proper security level, users can create their own and the Restaurant365 dashboard list will be replaced with their own custom dashboard list. To access dashboards, select Accounting (or Operations) - Reports - Dashboard in the left hand navigation. The user's default dashboard will load if one has been set for this user. Pressing either of these buttons will open a new browser tab with the Dashboard Designer. If editing an existing, you can remove dashlets by right clicking the dashlet and selecting Delete. Dashlets can be moved around the page by dragging and dropping (holding down left mouse button, moving around the page, and then releasing the left mouse button). As you move it around the page the sections will highlight in yellow (pictured below) to show how much space it will take up and where exactly it will fit in the page (as shown below). To add additional dashlets to the report, drag them on from the Existing Content section of the left hand pane (outlined in orange in below image). To learn more about creating charts/reports that will show in the Existing Content section, click here. Once dashlets are on the dashboard, even though they initially lock into place, you can also re-size them manually. To manually re-size, click the desired dashlet and it will be highlighted in red. Then put the mouse over the red edge of the dashlet and the mouse pointer will turn into 2 arrows. Hold the left mouse button down and drag the edge of the dashlet to make it smaller or larger. Once at the desired size, release the left mouse button and the dashlet will lock into place at its new size. The most important factor when saving a dashboard is where you choose to save it because this impacts the security level of who can see it. When ready to save, press the Save disk icon (as shown below) and a dropdown will appear. If creating a new dashboard only a "Save Dashboard" option is available but if editing an existing dashboard you will also have a 2nd option to "Save Dashboard As...". If editing and you select "Save Dashboard" this will overwrite the existing dashboard whereas "Save Dashboard As" will allow you to give a new name for your dashboard and leave the original dashboard un-modified. Once you select a save option the Save As window (pictured below) will pop up where you can set the name of the dashboard and choose where to save it. Once you've typed the name, in the folder hierarchy below, click the Organization folder which will expand to show your site folder (my site name in the screenshot below is "demo"). Click your site folder which will expand to Accounting and Manager folders and you will select one of these to save your dashboard there. 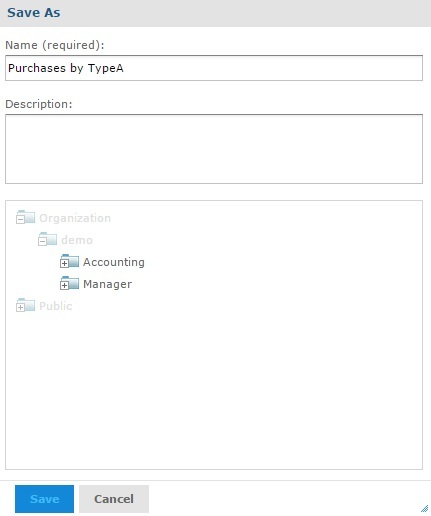 Saving in Accounting means only users with the Accounting Manager role will see it and saving in Manager means users with either Restaurant Manager or Accounting Manager will see it.